In Santeria, orishas are the gods or beings that believers interact with on a regular basis. The number of orishas varies among believers. Santeria originates from an original African belief system and in this, there are hundreds of orishas. On the other hand, New World Santeria believers generally only work with a handful of them. Aganyu is the orisha of the violence of the earth, of volcanoes and earthquakes. His fiery personality reflects these aspects and his color is red. He is also called upon to cure fevers. Despite his fiery associations, Aganyu is also known for once having worked as a ferryman at a river. As such, he has become the patron orisha of travelers. He is most commonly associated with St. Christopher, who is the patron saint of travelers in Catholicism. This comes from a story in which he carried a small child across a river. Aganyu is also sometimes associated with the Archangel Michael and St. Joseph. A double-edged wooden ax covered with red, yellow, and blue beads represents him. Two bull horns can also be used. Babalu-Aye is the orisha of illness and is called upon by beggars, the sick, and the disabled. He is viewed as compassionate and humble, although he can just as easily cause infections as cure them. Babalu-Aye is depicted as being covered in sores, and so skin infections are a particular area of his influence. Babalu-Aye is equated with Lazarus, a Biblical beggar man mentioned in one of Jesus's parables. Lazarus' name was also used by an order in the Middle Ages that was established to care for those suffering from leprosy, a disfiguring skin disease. Common symbols of Babalu-Aye are crutches, reeds, cowrie shells, and dogs. Light blue and royal purple are his colors. Chango, or Shango, is the Orisha of fire, thunder, and lightning. He can be invoked to bring revenge upon enemies. He is an arrogant, violent, and risk-taking orisha. Those who cross him risk death by fire or electrocution. He can be a source of both vengeance and justice, of representing both raw a rage and a channeled strength. He is also a passionate womanizer. Thus, is also associated with male sexuality, fertility, and virility. Chango has a long-standing feud with Oggun, seen in the New World as his brother. As such, nothing made of iron can be associated with Chango, as Oggun rules that metal in particular. Symbols of Chango include a double-edged wooden ax, cup, thunderbolt, castle (which is often depicted under St. Barbara's feet, representing the imprisonment before her martyrdom), and spear. His colors are red and white. Eleggua, also known as Eshu, is the most powerful of the orishas after Obatala. He is a messenger, a trickster, a warrior, and an opener of doorways, allowing for new experiences. Travelers often seek his protection. He is a keeper and seer of secrets and mysteries. He rules the crossroads as well as fate since he can see all of the past, present, and future. His personality is playful, mischievous, and childlike, but also clever. He is a cause of accidents and of conditions involving the blood. All rituals start with making offerings to Eleggua in recognition of his position as an intermediary between humans and orishas. As the orisha of communications and the opener of doorways, it is he who allows the petitions and sacrifices of humans to be known to the orishas. As a trickster, he challenges people to consider alternative possibilities and possible outcomes, which may or may not lead to positive consequences. Thus, he is also a tempter, and Christians sometimes associate him with Satan (as they also tend to do with trickster deities of other cultures, such as the Norse Loki). However, Eleggua in no way represents evil. Eleggua is particularly fond of children and often disguises himself as one. This has led to him being associated with Anthony of Padua (commonly depicted carrying a young Jesus), the Holy Child of Atocha (Jesus in the disguise of a child who fed starving Christians in Spain), and Benito, the Holy Infant of Prague. In addition, he is also associated with Martini of Porres. A whistle or a hooked staff painted red and black represent Eleggua. His colors are red and black. Do You Know the Santeria Gods? How Do Luciferians View Lucifer? 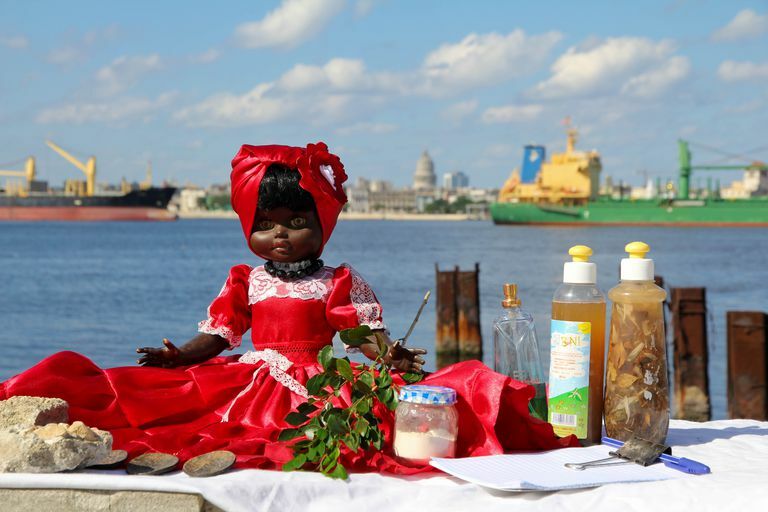 Is Bondye the Only God in Vodou? Who Are the Biblical Demons and Devils Named in the Satanic Bible? What Do the Elohim Have to Do with the Raelian Religion?